From Jinglepot to Chase River there are 13 manufactured home parks. I’ve described them all below – or you can scroll down all the way to the current listings. Brookdale (55+) - 61 12th St. Adjacent to Southgate/South Parkway shopping including supermarket, RONA, Buckerfields, bus route and more. Chase River Lawlor Rd - Behind Southgate Mall near the railway. Chase River Old Victoria Rd (55+) - Directly beside the highway near the Calico Cat Teahouse. Ed’s (55+) - Addresses of homes are all "Honey Drive". Quiet location beside the Chase River in Harewood. Meadow Ridge Estates - 295 9th St. At the corner of 9th St and Douglas. Mountain View Park (55+) - 80 5th St. 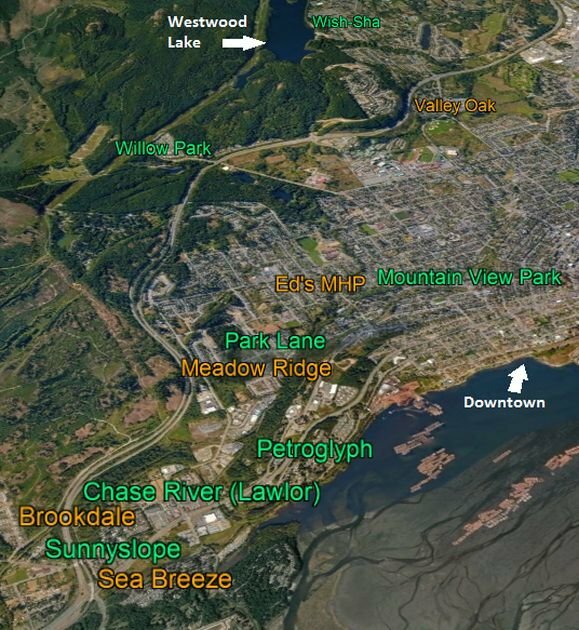 Closest park to downtown Nanaimo. Park Lane - 971 Douglas Ave, Beside Park Avenue Elementary School. Petroglyph (pet approval uncommon) (19+) - 1000 Chase River Rd. On a ridge just south of Petroglyph Park. Some ocean and estuary views. Sea Breeze (55+) - 25 Maki Rd. Walking distance to shopping or to estuary trails. Sunnyslope (55+) - 1359 Cranberry Ave. Walking distance to everything. Valley Oak (45+) - Close to VIU and Buttertubs Marsh, 3 minute drive to downtown or Westwood Lake. Has an RV storage compound. Willow Park (55+) - Tranquil setting surrounded by large trail systems like Colliery Dams Park and Morrell Nature Sanctuary. Wish-Sha (no pets) (55+) - Up at Westwood Lake, bordering its recreational trail system. Listings are below, but you can also contact me and I'll set up an email alert for you.